Historically, the development of oil refining industry in Tatarstan was determined by its economic efficiency. Possessing huge reserves of hydrocarbon feedstock, the Republic - a leader in oil production in the USSR – for half a century supplied feedstock to other regions of the Union and abroad. The lack of crucial processing facilities impacted the regional economy in general and, as a consequence, the development of the entire country. In order to address this, TAIF PSC established its branch TAIF-NK in the Nizhnekamsk industrial hub in 1997 (in 1998 - CJSC TAIF-NK , reorganized into PSC1 in 2006), that developed intensive work on design and construction of an oil refining complex. On the basis of a rented Crude Oil Distillation Unit CDU/VDU-7, in a short time TAIF PSC further modernized the production facilities at its own expense and later purchased the Plant. As a result, the Plant achieved the design volume (7 million tons of crude per year) as early as in two years, whilst improving quality and refining depth. However, it was only the first step in the strategic plans of TAIF Group. Simultaneously, TAIF started the design and construction of an additional large Middle Distillates Hydrotreatment Complex and Visbreaking Units as well as a bitumen unit. From 1999 on Tatneft and Nizhnekamskneftekhim also actively participated in construction of the units. Later, their stakes were purchased by TAIF-NK, including a non-functional Bitumen Unit. Financing of this project involved borrowing funds from the Sberbank of Russia. The Crude Oil Distillation Plant CDU/VDU-7 was transferred by TAIF PSC to TAIF-NK’s PSC authorized stock at the end of 2007. According to a TAIF Group strategic development plan, design and survey work was carried out since 2000 and in 2003 a large-scale construction of major production facilities – Gasoline Plant and Gas Condensate Processing Plant that were put into operation in December 2005 - started. The first batch of gasoline meeting all the design requirements was produced in February 2006. In 2007, TAIF-NK PSC has acquired ownership the Gasoline Plant . In 2007, a range of production facilities was put into operation: a bitumen unit, jet fuel preparation and storage facilities, catcracking heavy gas oil shipment facilities and a desulphurization unit for propane-propylene fraction, butane-butylene fraction and light gasoline. These facilities were aimed at production of oxidized bitumen and jet kerosene RT and Jet A-1 grades meeting global quality standards. In 2007 TAIF-NK PSC executed reconstruction of a vacuum gasoil catalytic cracking unit (FCC) in order to ensure compliance of the output quality with the requirements of the EURO-4 environmental standard. Since May 2008, TAIF-NK PSC completely switched to the production of motor gasoline meeting the EURO-4 environmental standard. In 2008 TAIF-NK PSC acquired control over the liquid bulk terminals of Port Caucasus and began development of its own filling stations network. By the end of 2011, 28 petrol filling stations were in operation under the brand name of TAIF-NK. In 2009, TAIF-NK PSC commissioned methyl tert-butyl ether (MTBE) and tert-amyl ether (TAME) synthesis units at the Gasoline Plant to produce blending components with a high octane number for gasoline production. In 2010, the company acquired control over the crude loading terminal of LLC "Chulman-Trans" and continued modernization of the existing facilities. In 2011, a final configuration of TAIF-NK’s PSC Heavy Residue Conversion Complex was determined, which implied implementation of a heavy oil residue processing technology on the basis of a Veba Combi Cracking (VCC) process. The project aimed at improvement of crude conversion depth while increasing the yield of light oil products. Construction of the Complex is supposed to result in elimination of production of all kinds of fuel oil, along with vacuum residue and VGO and simultaneous increase in the yield of the products complying with the requirements set forth by the Technical Regulations of the Russian Federation. In early November 2012 the company announced the begining of Heavy Residue Conversion Complex construction which is planned to be started up in 2016. After its' input Russia will get the best in the world in efficiency refinery production. In late May 2012, TAIF-NK PSC produced the diesel fuel ecological class-5 in accordance with the requirements of the Technical Regulations "On requirements for motor and aviation gasoline, diesel and marine fuel, jet fuel and heating oil." And on June, 25th, 2012 a EURO-5 diesel production facility was put into commercial operation at TAIF-NK’s PSC Refinery. The company was the first in Russia to switch to 100% diesel fuel production that fully complied with international quality standards. In November 2012 a solemn ceremony with participation of Tatarstan Republic President R.N.Minnikhanov, devoted to official beginning of Oil Conversion Complex construction on basis of unique technology Veba Combi Cracking (VCC), have taken place. Participants of the ceremony have laid into foundation of the future Complex capsules with a Message to descendants. Construction of the given Complex is directed at increase of oil refining depth to not less than 95 %. Starting of the Complex into operation will allow to increase manufacture and realization of straight-run gasoline, that is raw material for petrochemical complex enterprises, as well as to increase manufacture of “EURO-5” diesel fuel. 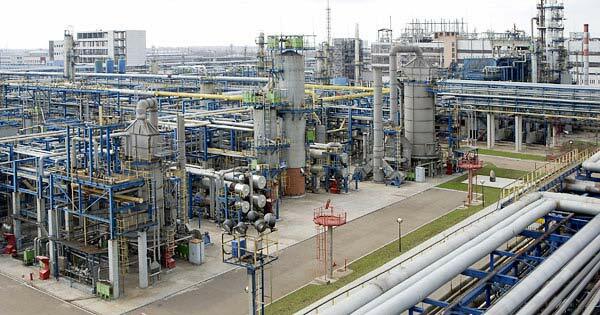 Today Public Stock Corporation TAIF-NK, which comprises the largest refinery in Tatarstan, Gasoline Plant and Gas Condensate Processing Plant, is a leader in the oil refining industry of the Republic of Tatarstan. The share of TAIF-NK PSC in the total volume of crude oil processing was 3.1% in the Russian Federation and 53.7% - in the Tatarstan Republic. In this case, the total volume of oil produced in the Tatarstan Republic, the company TAIF-NK produced 100% of jet fuel, 95.7% of diesel fuel, 87.8% of motor gasoline, 54.5% of straight-run gasoline, and 50.5% of furnace fuel oil. Among the major refineries in Russia, TAIF-NK PSC is the 6th in terms of the feedstock processing depth.